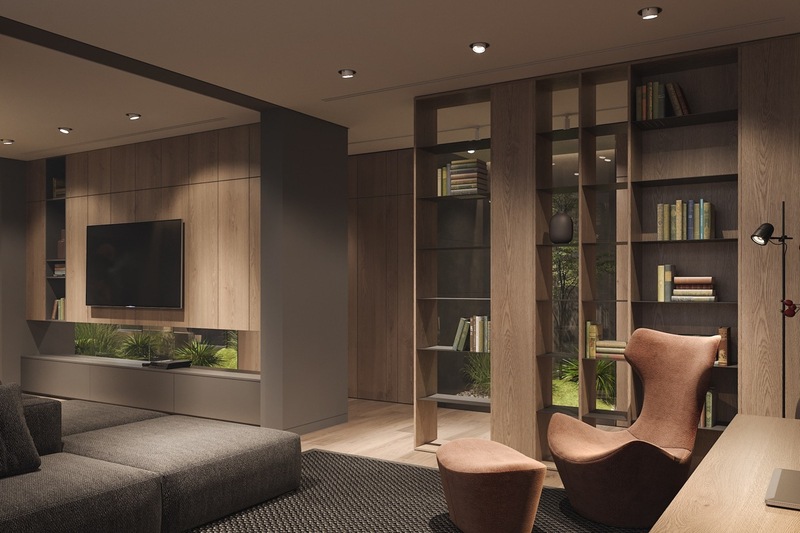 This cosy apartment with indoor green spaces was designed and visualised by the talent at Bezmirno Architects. 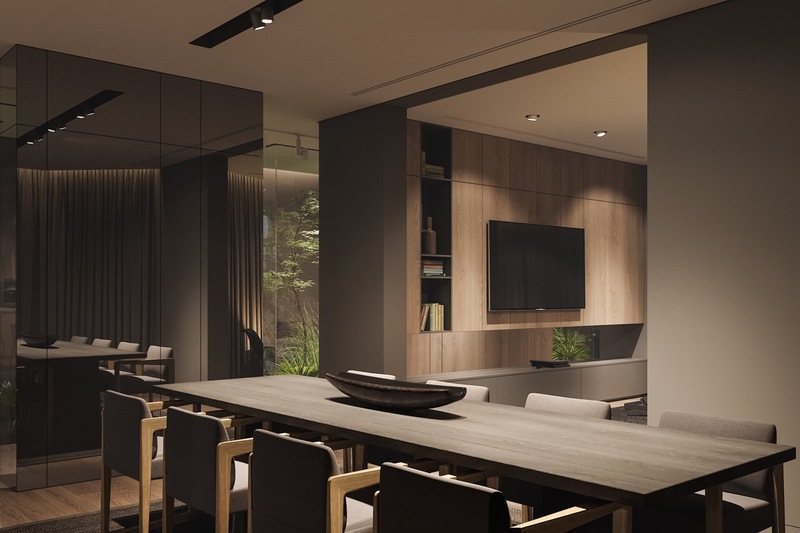 The 320 square meter home is divided into two main parts: The first part is a sociable area, which includes the kitchen, dining room, living room, home office and terrarium rooms. 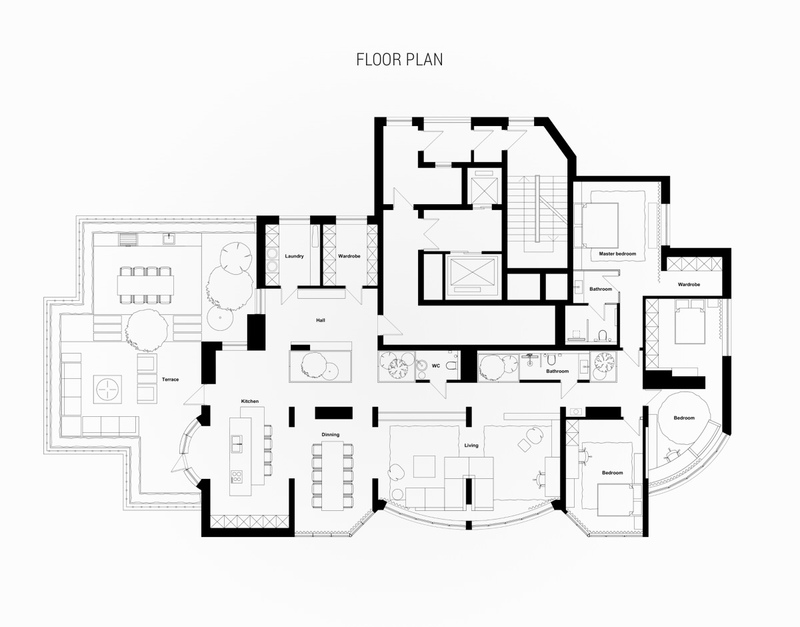 The second part of the home holds private quarters, which includes the master bedroom, two children’s rooms and separate bathrooms. 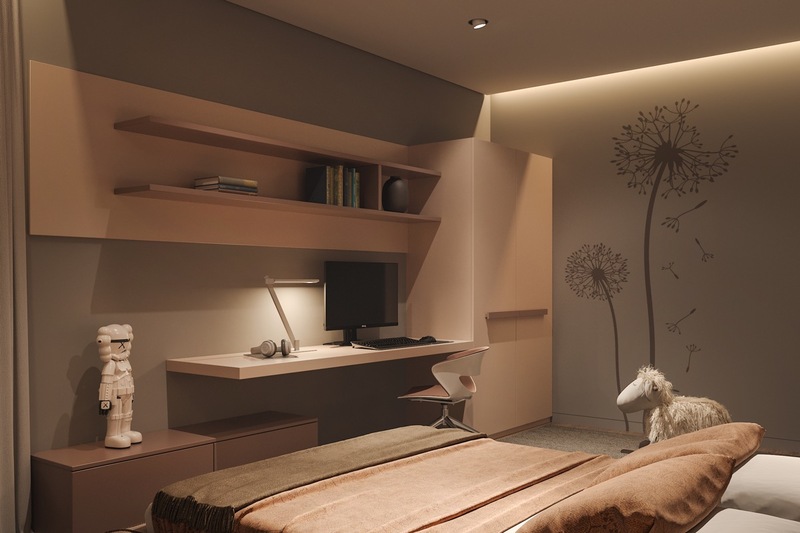 The decor throughout the two areas is a smooth flow of warm neutrals so that there are no harsh boundaries. 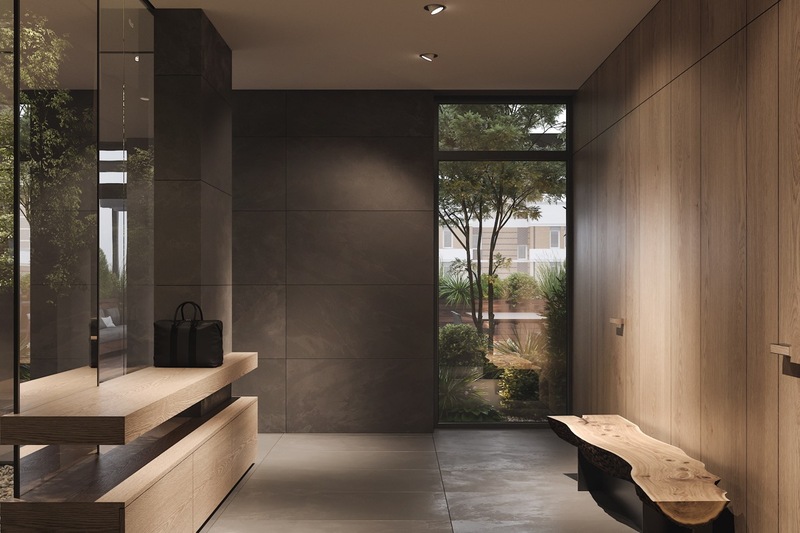 Use of natural materials makes this an environmentally responsible project, and the considered choices result in a refined and atmospheric minimalist interior. 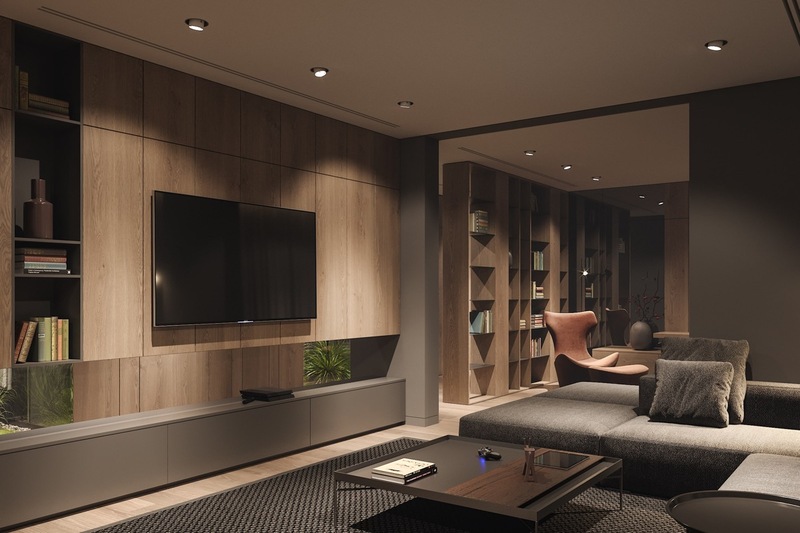 The upper wooden panels behind the tv descend approximately three quarters of the way between two structural supports. 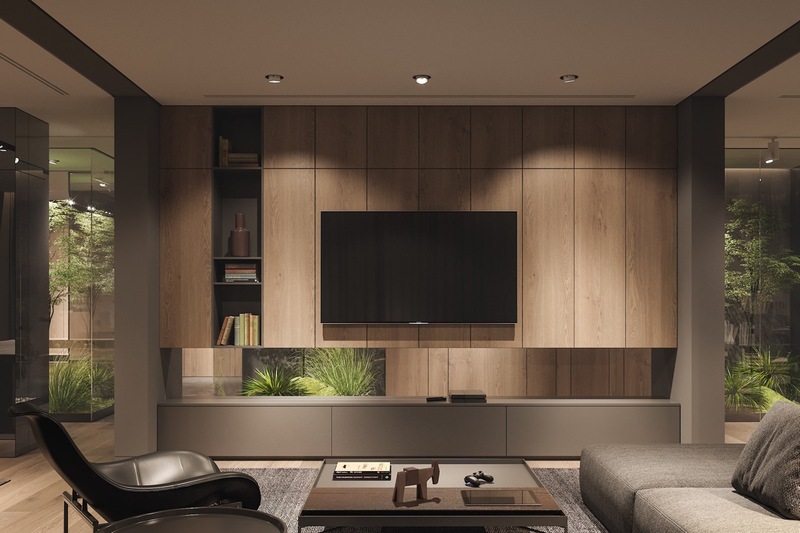 A gap is left between the upper panels and a floor standing media cabinet, which offers a view through to the hall of terrarium rooms. The indoor greenery from the hallway peeps through, freshly colouring the neutral living room. A black modern lounge chair reclines to take in the revitalising view. 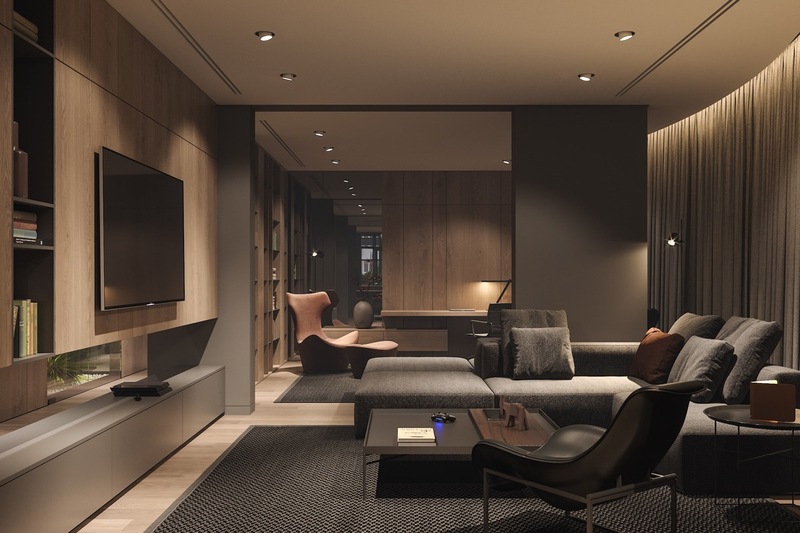 Sections of the living room sofa wrap around the partially dividing wall to connect the lounge with the neighbouring home office. An accent chair with footstool faces the extra seating. At the other end of the open sided living room we enter the dining area. 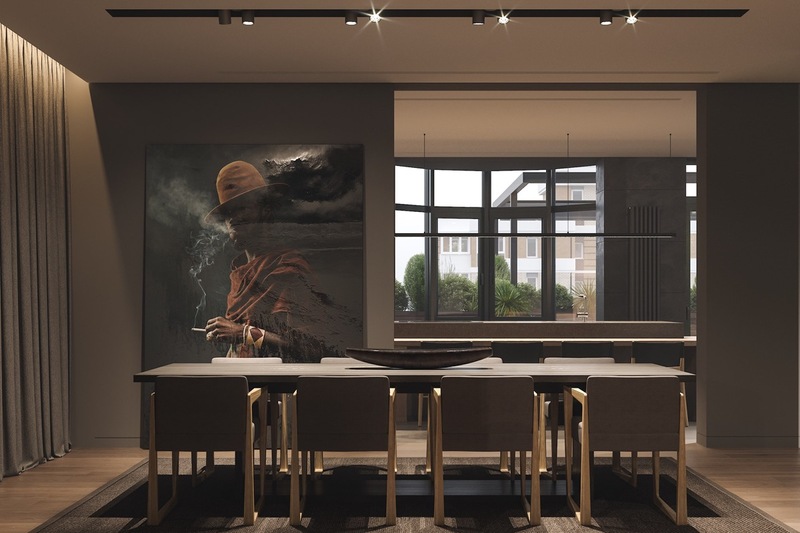 Eight modern dining chairs fall in line along each side of a rectangular dining table. 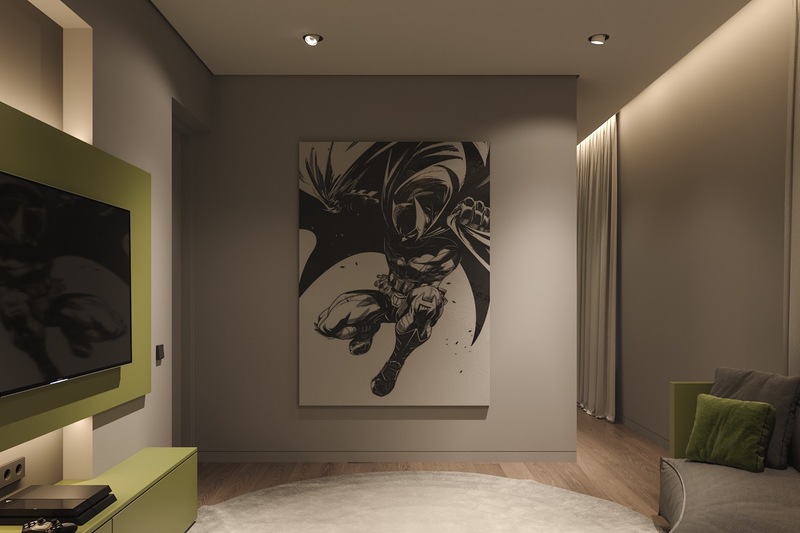 A large example of modern art brings personality to plain grey walls. The kitchen is connected to the formal dining room, and features a dining area of its own. 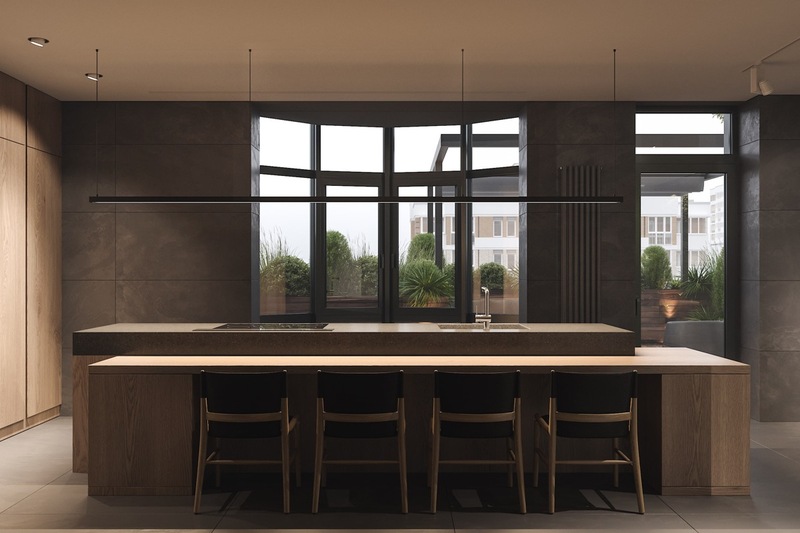 Four dining chairs are seated along the lowest edge of a split level kitchen island. See more kitchens with island ideas. 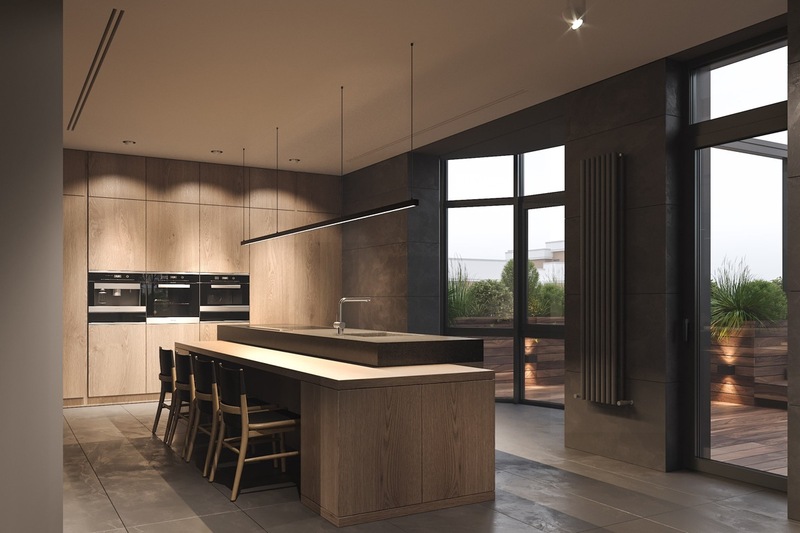 A linear suspension lamp illuminates the kitchen sink and hob area, plus the casual dining spot. 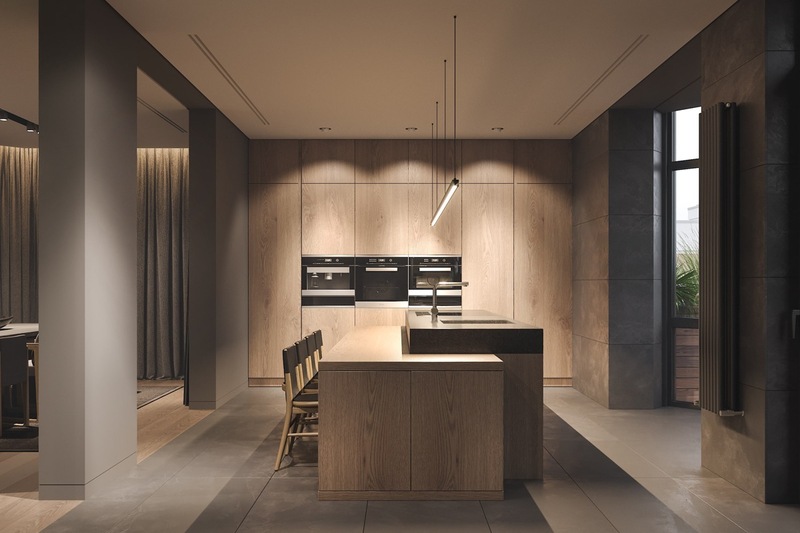 A bank of full height units and integrated ovens fill the far wall of the room. The home is blessed with over 80 meters of landscaped terrace. 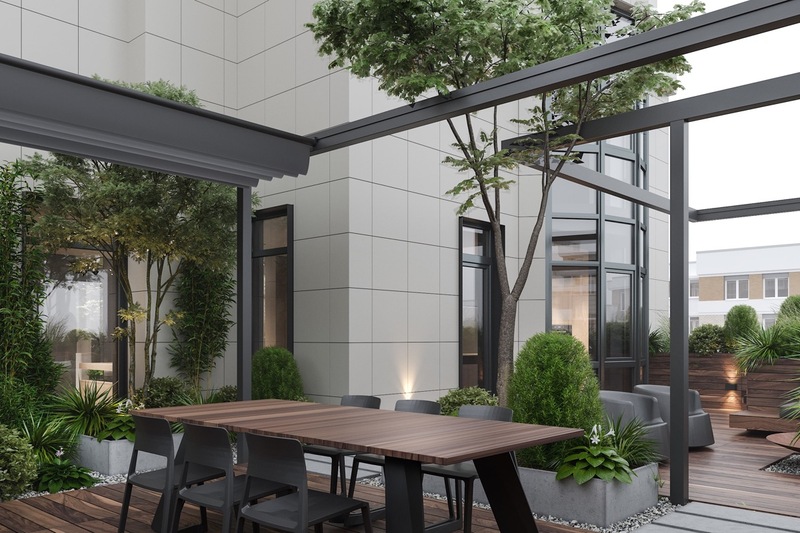 The stylish outdoor space provides not only a revitalising place to rest, but also a barbecue spot and an outdoor eating area. 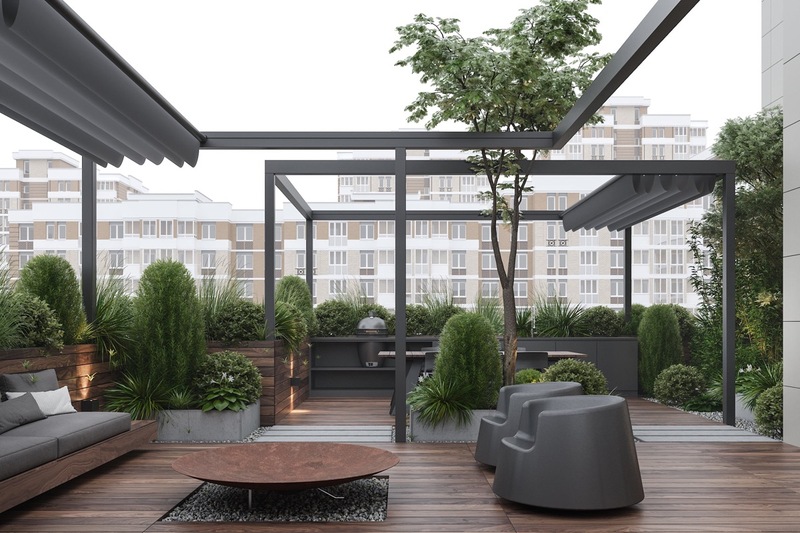 The terrace is accessed from the kitchen, which is convenient for transferring food supplies outside to grill, or serving up ready made dishes to eat al fresco. 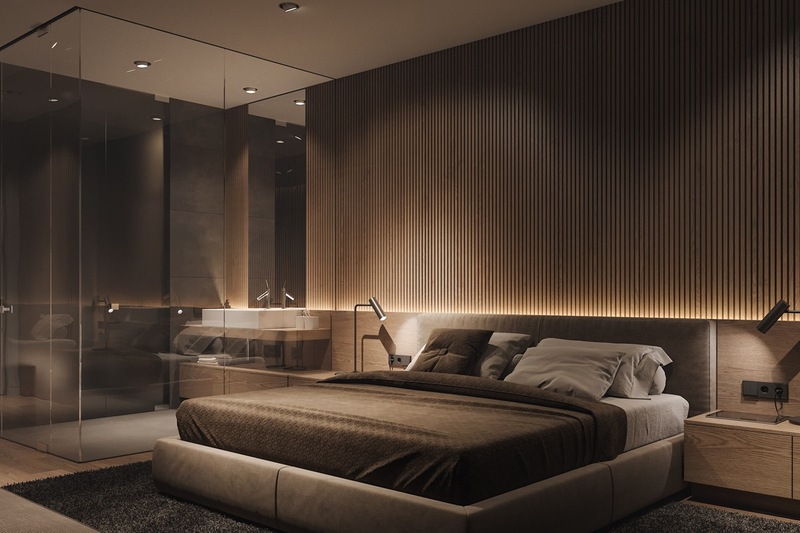 The built-in glass terrariums push through the apartment from the greened terrace to the sleeping quarters. See more homes with green spaces. 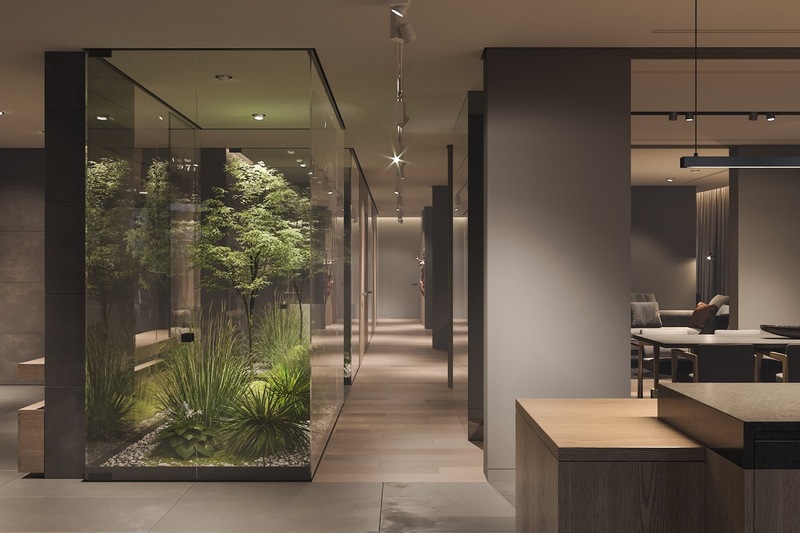 Natural materials coupled with glass atriums give the interior of the apartment a look that is refined in its simplicity. 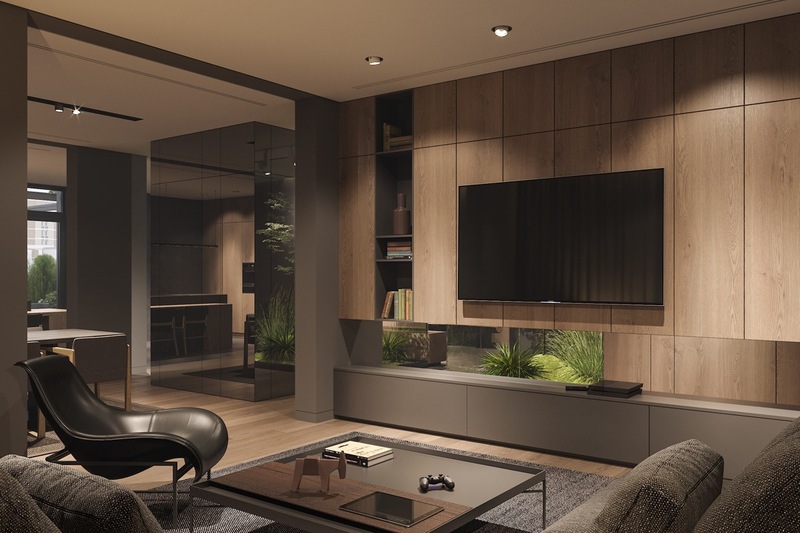 The fresh green areas and modern furniture result in a unique living space that would please homeowners at any stage of life. 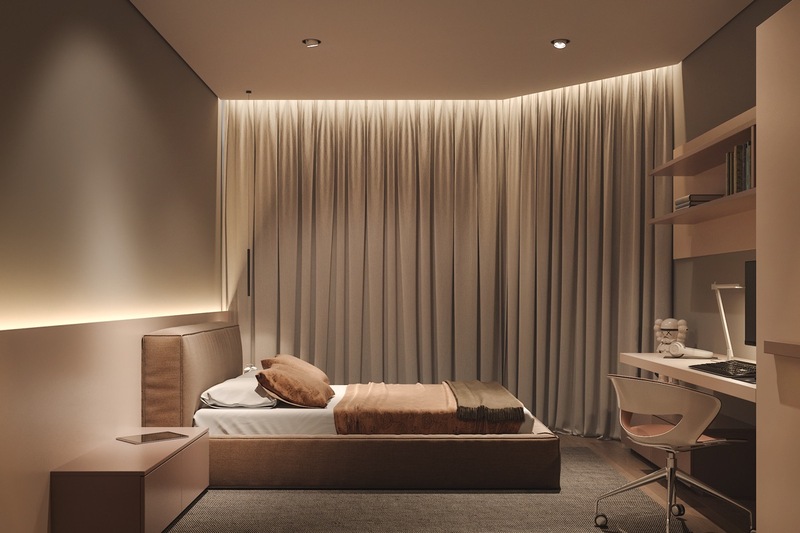 Light and dark shades combine and contrast throughout. 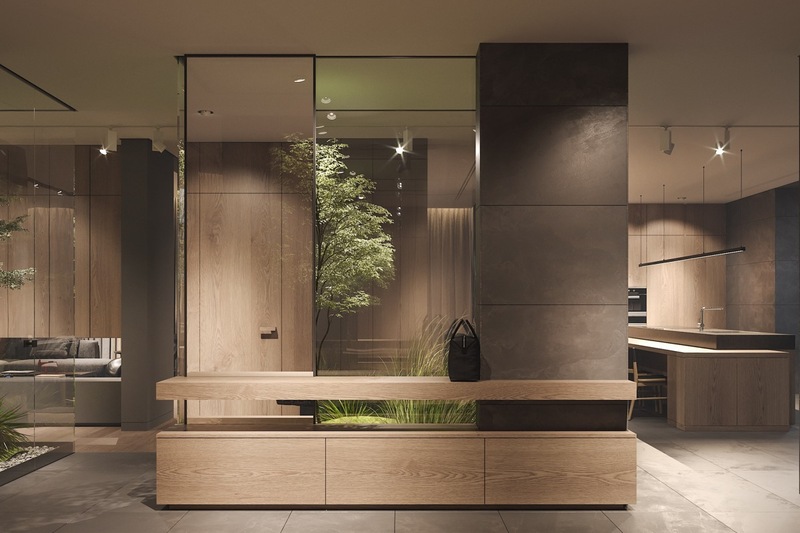 The back of an atrium has been clad with mirror and wood panel in the home entryway. A wood sideboard runs the length of the case. 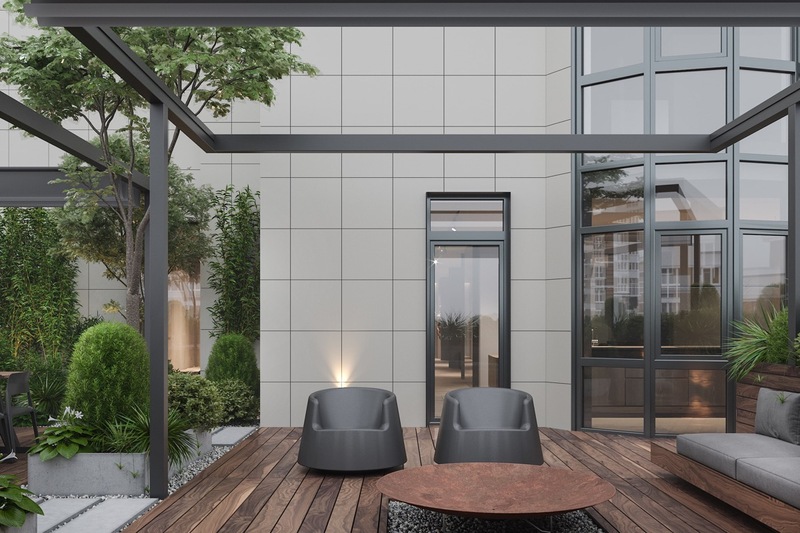 The arrangement of atriums, with concealed and revealed faces, creates the illusion of an indoor-outdoor living space. 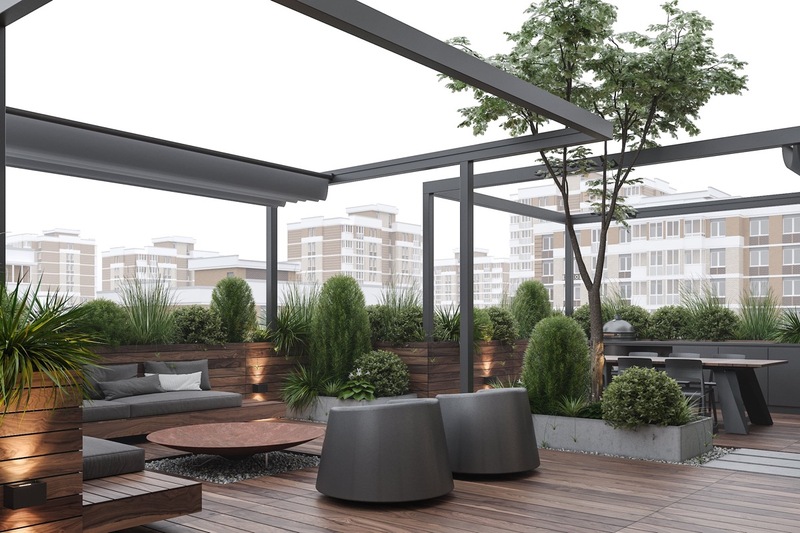 The illusion is deepened further by views of surrounding outdoor terrace. A beautiful live edge bench ties in with the nature theme. 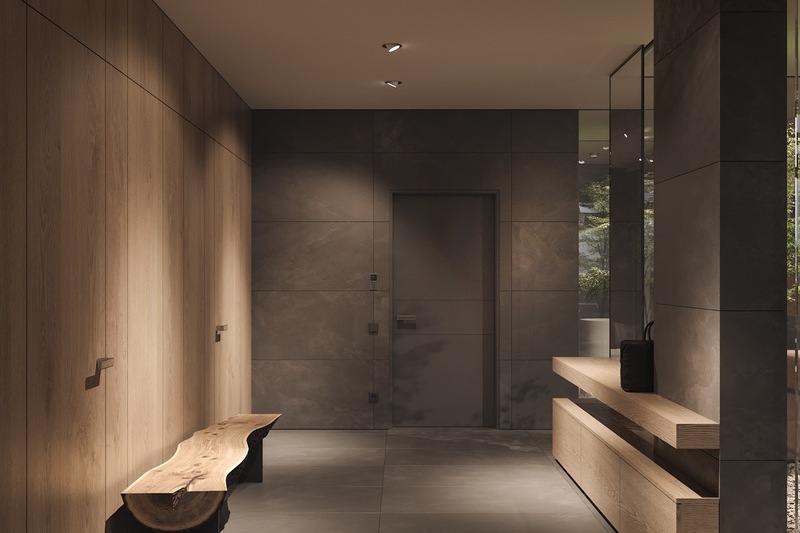 Grey tile and wood panelling complement each other in a bold and established look. 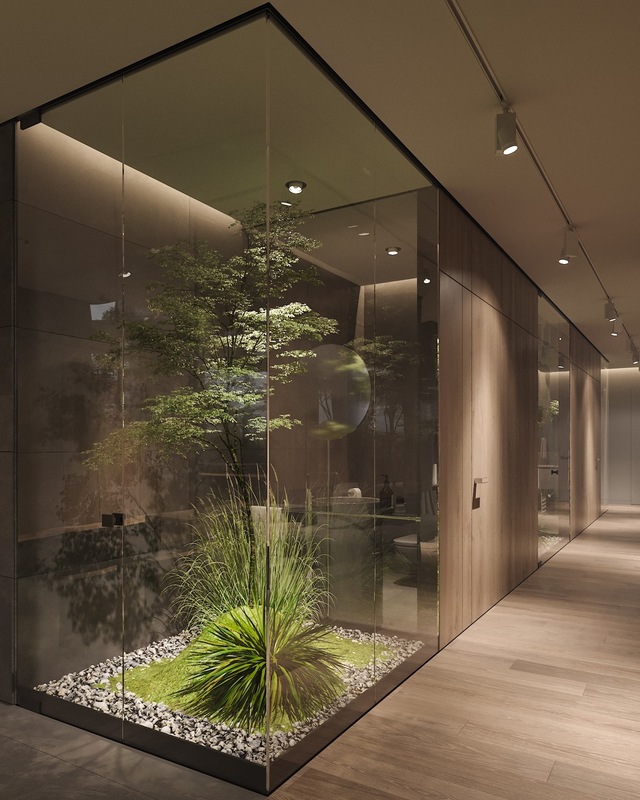 Live greenery also becomes visible through the walls of the bathrooms due to the use of smart glass technology in glass partitions. 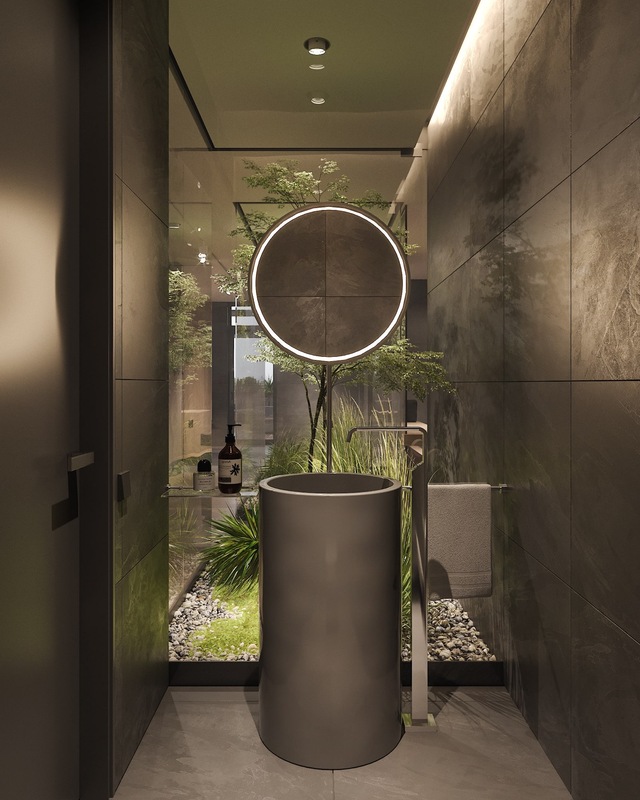 One such partition supports an illuminated vanity mirror above a unique bathroom sink, giving the user of the basin a gorgeous garden view despite the internal position of the bathroom. A naturist statue dances down the hallway. 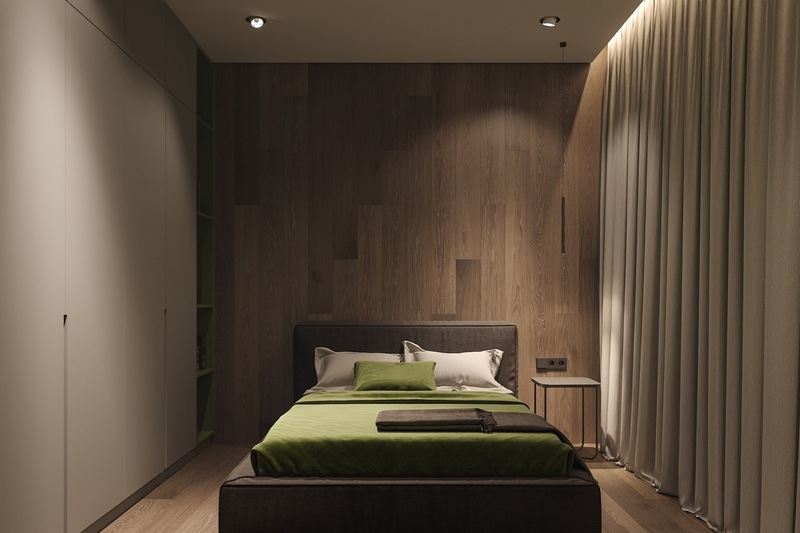 The recessed headboard LEDs highlight the slatted texture of the feature wall. 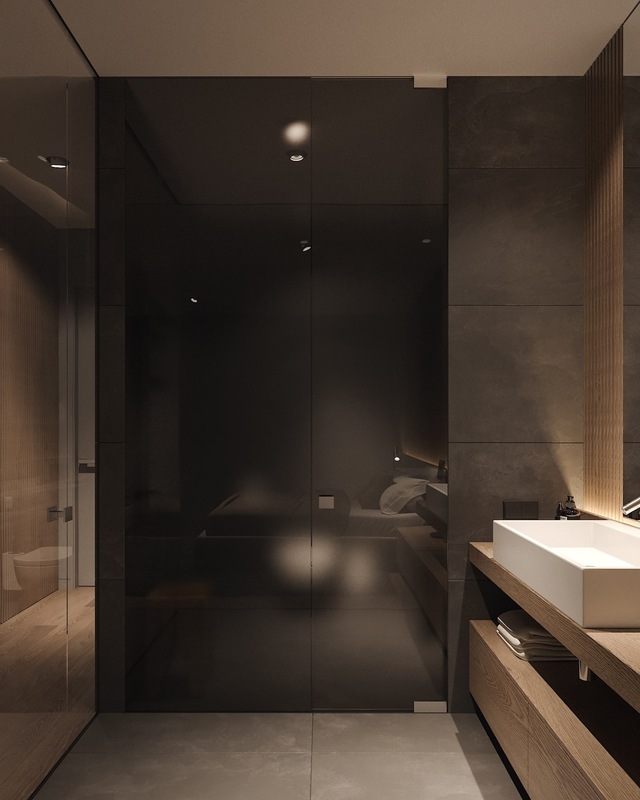 A glass wall ensuite resides inside the master bedroom. 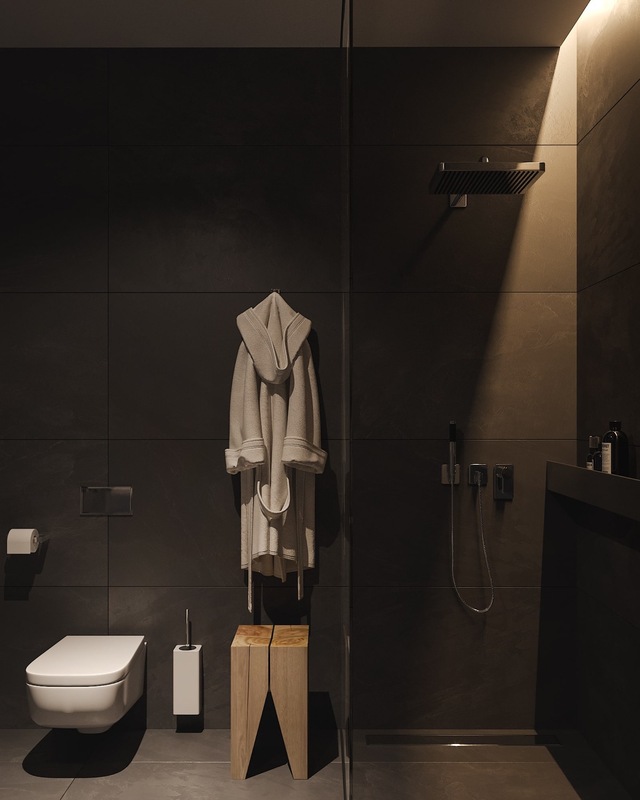 Decor in the ensuite bathroom is dark and moody, with dominant black tile and wood accent pieces. 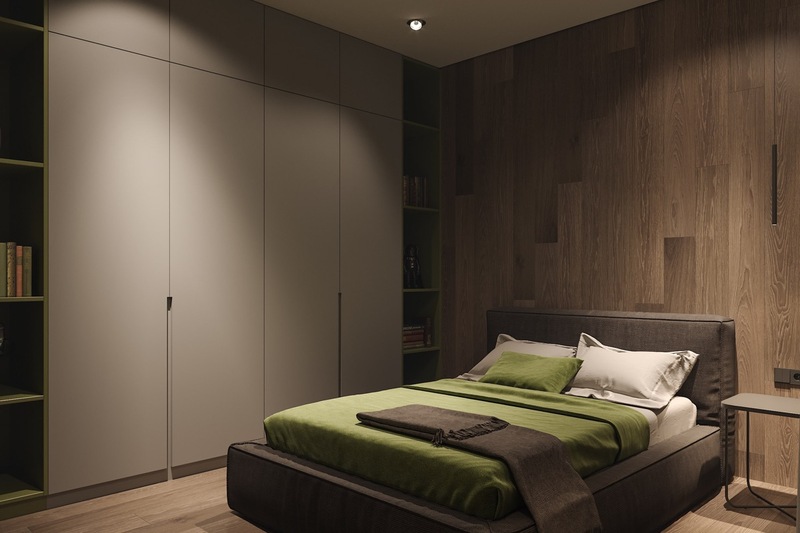 A second double bedroom design incorporates green as an accent colour. A green bed set looks vibrant on a black fabric bed. 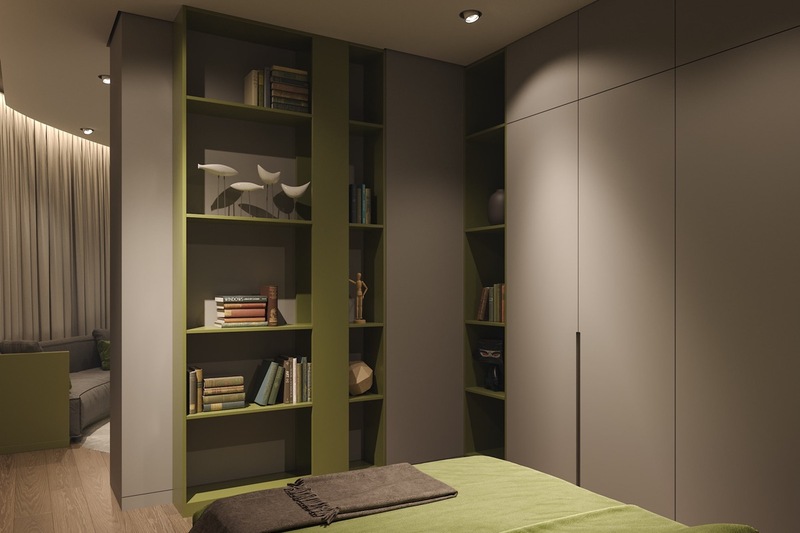 Green bookshelves perfectly match the shade of the bed set. 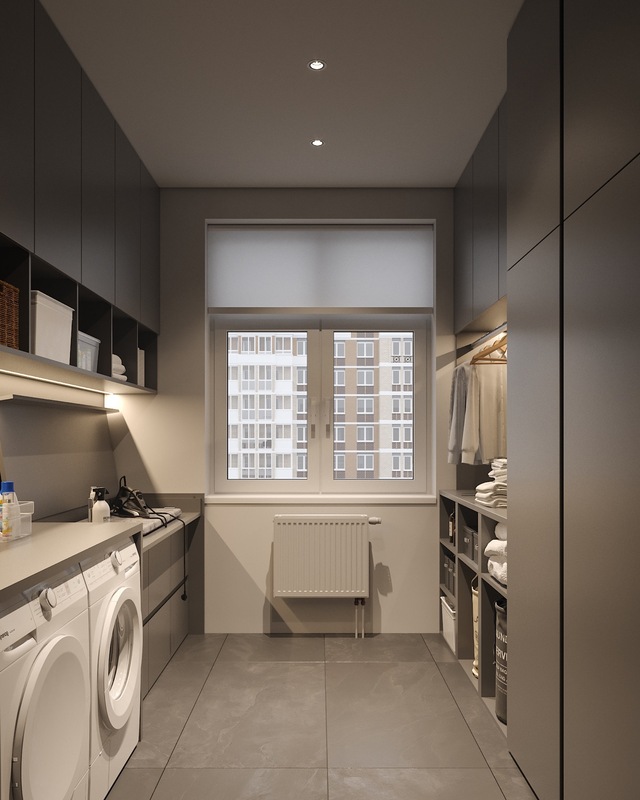 Light grey cabinets balance out the fresh hue and provide the remainder of the storage space. 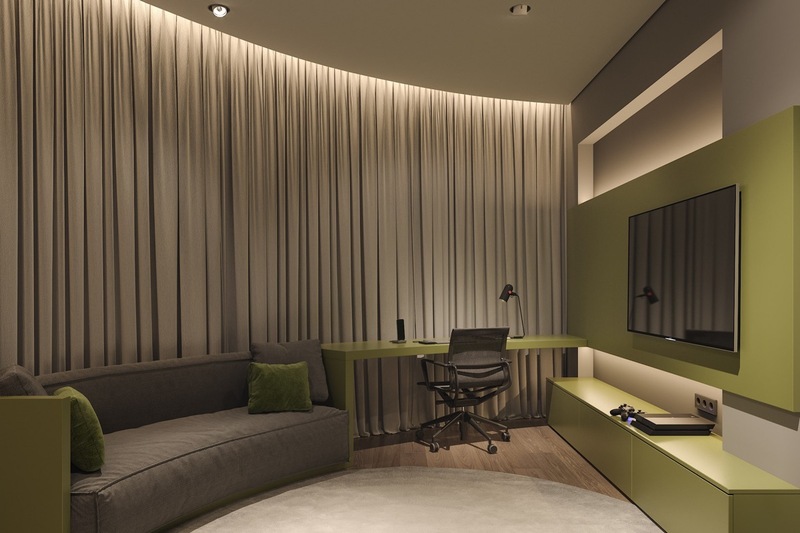 The kid’s study area in the room is also decked out in green accents, with a green desk and adjoined tv wall. Green scatter cushions liven up a curved grey sofa too. 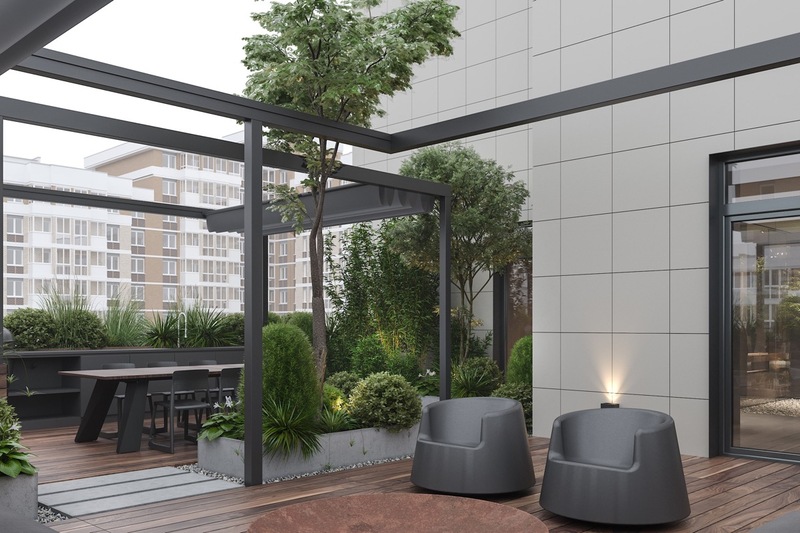 Out on the terrace, plants flourish in concrete and wooden planters. An outdoor coffee table rests on a pebble core between built-in bench seats and outdoor chairs. The modern outdoor chairs sit on a wooden deck, which matches the terrace to the interior decor of the home. A short path leads to the outdoor dining area.